> This place should just due already tbh. Yo! That's some lovely art right there! You don't have to do it, if you don't want to. But if you could, that would be lovely! Keep up the great work! also, the art does not belong to me, it was made by a friend. Yo, that's chill. Can I get a pic? 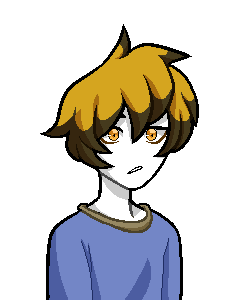 @Amurlintz, a talksprite for your boy! @RoseStrider, I'm afraid I'll be needing some sort of reference image or a detailed description of whatever character you want me to draw. 'Can I get a pic' is sort of really vague. Is it possible to get a -sprite? Something along the lines of Jaspersprite or one of the troll's lusussprites? @pickedPocket, I mostly only do humans and trolls (since they're much easier to do) rather than sprites of the lusii. Hope you understand. Nope I totally understand that; I just got a bit excited when I saw the Nepetasprite and the AU!Davesprite. Hey folks! I'm not dead, just a little bit busy with other real life stuff. I arrive with a more traditional looking Fuchsiablood Nepeta talksprite. "^.w.^ < hey everyone, prepurr fur some turbulence, let minnow if you got a purroblem!" Requests are still open, but still fairly slow. Enjoy the Nep. Question: What software do you use to animate good quality GIFs? Is it free? I use a website called gifmaker.me and yeah it's free lol.